OPPOSITION Alliance has accused opposition discrediting the national dialogue process of being hired by Patriotic Front to increase the number of voices that are advocating for a ZCID led process. Alliance spokesperson Sean Tembo was reacting to yesterday’s press briefing held at Pamodzi Hotel by United Liberal Party president Sakwiba Sikota, Forum for Democracy and Development president Edith Nawakwi, MMD faction leader Felix Mutati and Rainbow Party Secretary General Winter Kabimba. Tembo said, “we are all aware that the Patriotic Front has woken up some long-forgotten politicians, from their political slumber, with the aim of trying to increase the number of voices that are advocating for a ZCID led dialogue process,” adding that “The main purpose of these hired political elements is to muddy the waters and bring about confusion regarding this dialogue process, on behalf of the PF, without the PF itself getting its hands dirty”. He said it was a fact that the opposition Alliance preferred the Church mother bodies to lead the dialogue process over the ZCID, to conduct the national dialogue and reconciliation process because the church is more reputable, more credible and more upstanding than ZCID. “Our position on this matter is very clear, and we believe that this is where we are not able to agree with our brothers and sisters in the “PF” Alliance who prefer ZCID to conduct this national dialogue and reconciliation process, whether directly or indirectly through a powerful underhand called a Joint Secretariat,” he said. 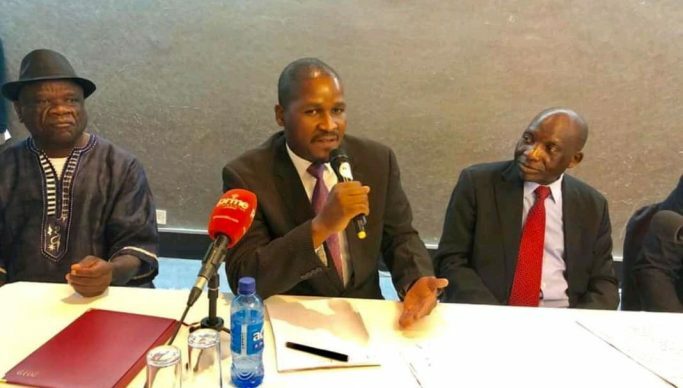 He said his alliance had further noted that, “there is an attempt by the ‘PF’ alliance to try and ostracize UPND President Hakainde Hichilema, by seeking to portray a false picture that President HH had threatened to walk out of the Pamodzi meeting last Tuesday,” he said, stating that “At no time did President HH ever consider abandoning the meeting, because he was sincere in his efforts to try and help resolve the impasse on the MoU between ZCID and the Church mother bodies. It was the PF, led by Secretary General Davies Mwila and its alliance partners including ZCID, that walked out of the meeting”. He said the public should note that it was the PF that proposed a Church-led dialogue process, after rejecting the Commonwealth. “It is therefore, very strange that the same PF can today start undermining and insulting the church, and instead start to advocate for a ZCID led dialogue process. How many times should the PF be allowed to change their minds on who should lead the dialogue process?” he asked. The ‘counter opposition alliance led by FDD president Edith Nawakwi accused the opposition alliance for conniving with the three church mother bodies in trying to hijack the dialogue process in favour of the UPND. She accused Hichilema for trying to use his alliance members to push his agenda of having the church lead the process for his selfish desires.